How do I view the courses in my account? You can find the managed accounts in the Courses & Groups drop-down menu. View the courses in the account. Search for courses by using the Find a Course tool. 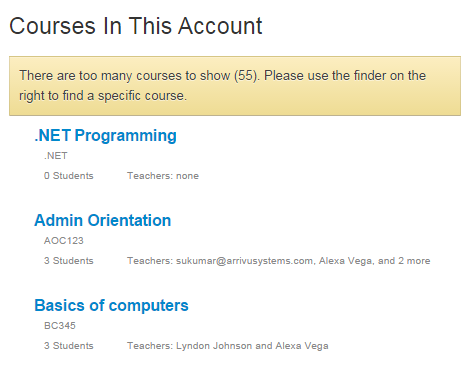 Type the course name in the course name field  and click the Go button . Click the Courses link  to see all the courses in the account. If you have organized courses in your account by sub-accounts, click the Sub-Accounts link  to view the sub-accounts and courses.